London: British Council, the United Kingdom’s international organisation for cultural relations and educational opportunities, has announced the second edition of its 70th Anniversary Scholarship programme for Indian Women pursuing a master’s in Science, Technology, Engineering and Math (STEM) in the United Kingdom. 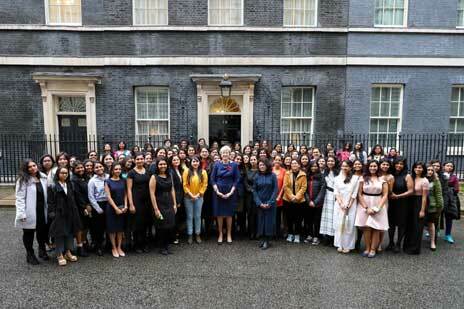 The announcement was made at a felicitation ceremony with Prime Minister Rt Hon Theresa May MP United Kingdom for the 104 Indian Women STEM scholars. The scholars are currently completing their Master’s in STEM education in 43 British Universities across England, Scotland, Wales and Northern Ireland. Prime Minister, Rt Hon Theresa May MP United Kingdom, met with British Council’s 70th Anniversary Women STEM scholars, demonstrating United Kingdom’s commitment to attracting the brightest Indian students to United Kingdom’s top universities. The awardees also met United Kingdom parliamentarians and connected with key businesses and universities to explore potential work placements and internships. The announcement of a second edition of the scholarship scheme edition follows a hugely successful first round, which celebrated the British Council’s 70th Anniversary in India. More than 50% of the 104 scholars are from Tier 2 and 3 Indian cities, underlining the British Council’s commitment towards improving access to quality education, skills and qualifications across the country; and creating opportunities for Indian women to succeed in India and globally. In the second year, the British Council and some of the world’s best universities located in the United Kingdom will fund full tuition scholarships worth GBP 1 million, for 70 Indian women to study a Master’s programme in STEM in the United Kingdom for the academic year 2019-20. British Council’s investment in women scholars supports Indian Prime Minister Modi’s shift to women-led development and the British Council’s own focus on women and girls and UN Sustainable Development Goal 5. The United Kingdom is a global leader in quality research – four of the world’s top ten universities are in the United Kingdom, with an exceptionally high standard of teaching and research right across the country. United Kingdom is currently ranked number two for science and research worldwide and through these scholarships, welcomes young Indian women to pursue STEM education in the United Kingdom. In the year ending June 2018, there was a notable increase of 32% in the number of Tier 4 visas granted to Indian nationals. Candidates applying must have an offer from a United Kingdom university by 30 January 2019. All details will be available on the British Council website.